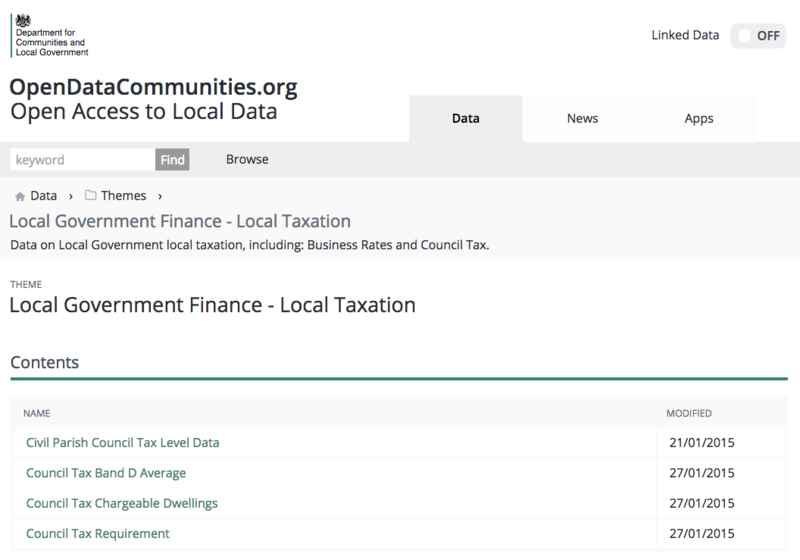 Opening-up Council Tax statistics – Open Data Aha! 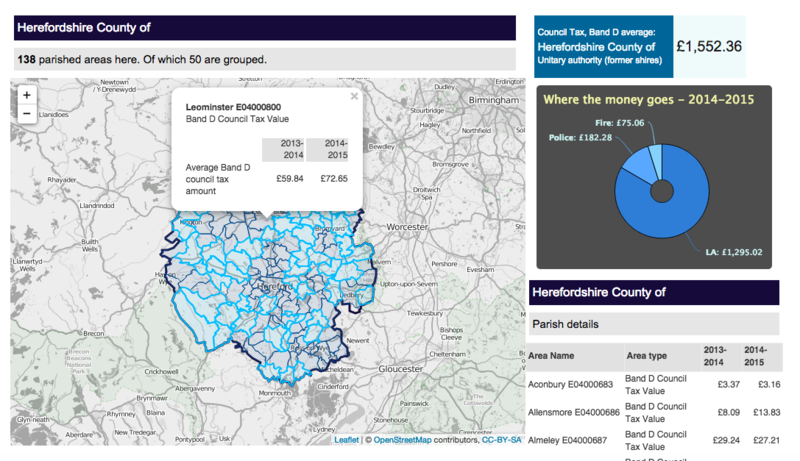 DCLG has been publishing council tax data at parish level since 2013-14. As part of opening-up the Department’s data, we wanted to make our council tax statistics more accessible. So we have now released data for all English billing authorities (at district and county level) and Civil Parishes via OpenDataCommunities. We have also developed a demonstration application to show how these sources can be queried and brought together in new on-line mapping and charting tools. We hope this will help you find your local area and allow you to see how much you are paying compared to other areas in the country. In England there are over 10,000 town and parish parishes, 17 charter trustees and two Temples of London (also collectively known as parishes). We have now published two years’ worth of data from local authorities on the council tax of these parishes, the number of people involved in paying parish council tax (known as a precept) and the amount of additional money added onto people’s council tax bill. Data are collected from Council Tax Return Forms completed by local authorities. A process has been undertaken to match the parishes recorded to standard ONS codes, but it has not been possible to match Charter Trustees, Temples and 26 parishes. These will therefore not appear on the interactive map, but the figures are present in the dataset. We aim to update the data annually following our data collections. The next update will be in the summer 2015. We want to ensure OpenDataCommunities serves your needs as best as it can. Does this feature open up this data as you’d like it to? Please leave your thoughts in the comments below, or get in touch at ODC@communities.gsi.gov.uk. ‹ Research – a dirty word in development circles?